Many destinations rely on a couple of well-worn beauty spots carry their images as a vacation hotspot. When it comes to Greece, those picture-postcard scenes of blue skies, bluer seas and whitewashed villages are everywhere. The sun-kissed Mediterranean country has enough perfect locations to last anyone a lifetime of vacations. And there’s seldom a better time to celebrate them on the week of Greece’s national day, March 25. Sun, sea and sand on Naxos Portara. 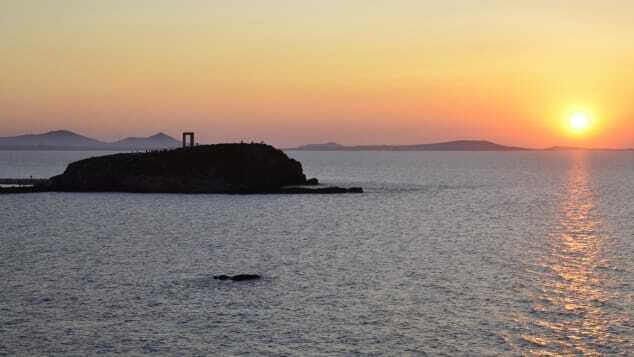 The largest island of the Cyclades, Naxos, combines Caribbean-looking sugar-sand beaches for sun-worshippers and a 3,000-foot mountain for hikers. Portara is the site of the worst of all mythical betrayals. It’s there that Theseus dumped Ariadne, daughter of King Minos, despite his promises to marry her and her help in killing the Minotaur. Not all was lost, however: the god Dionysus fell in love with her and composer Richard Strauss wrote a popular opera about her predicament. Karpathos has ancient underground chambers and shrines. One of the Aegean’s most mysterious of islands, Karpathos is hardly ever mentioned in historical texts, leaving archaeologists struggling to decipher ancient underground chambers and oddly constructed shrines. Its wild landscapes are only matched by its unique ethnic culture. 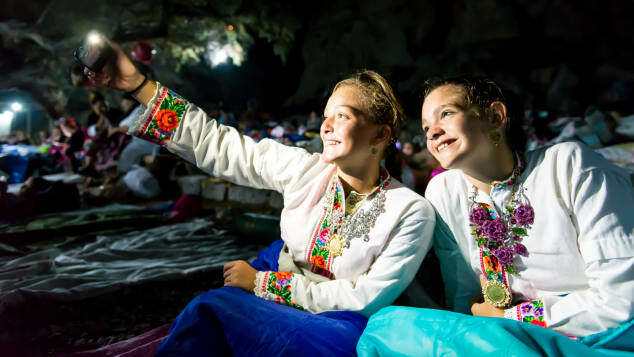 The village of Olympos (NOT Olympus) is so cut off from the rest of the island that women still wear traditional embroidered dresses even in the beginning of the 21st century. Don’t miss the Greek island of Ios, known for its iconic windmills. No Greek island encapsulates better the carefree, sun-drenched summer vacation than Ios. It has some of the finest beaches in the Mediterranean. Its nightlife is notorious with open-air clubs that start after midnight and continue beyond sunrise. 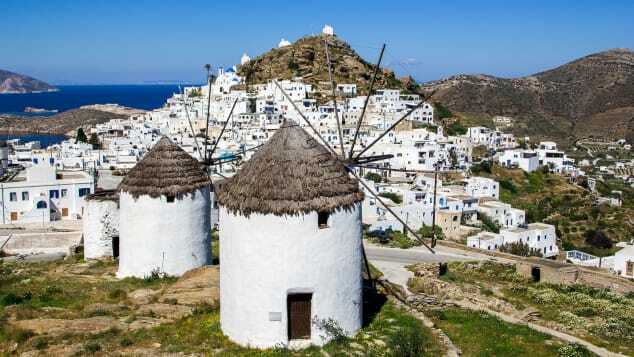 Finally, its capital, Chora, is a white-washed zigzag of narrow lanes whose iconic windmills are a reminder that, despite the heat and the sun, the island also draws a seasonal summer wind, the meltemi, acting as a natural air conditioner. Seafood in Greece is the best of the best. Greeks fuss about freshness like no other people, especially where seafood is concerned. 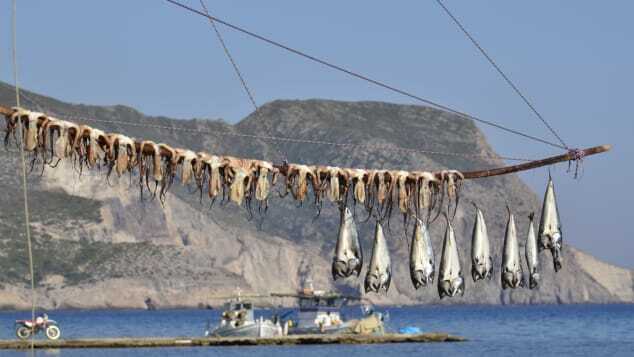 Many fish tavernas in the smaller islands or coastal villages have their own fishing boats and serve today’s catch. “Frozen” is a dirty word and many a waiter will warn a customer that the calamari or the sea-bream is katepsigmeno, frozen. Some restaurants will even go to the extent of letting you know where the fish was caught: nearby or in the deeper sea, signifying a longer journey and possible on-boat freezing. Andros, is a green, lush island close to Athens the birthplace of 20-odd ship-owning families who have endowed it with museums and art collections; it’s still easier to navigate around the island by boat than car even today. Many of its spectacular beaches feel isolated even in the height of summer like Pidima Tis Grias (The Granny’s Jump). According to legend, an old woman who betrayed the nearby fortified village of Kochylos to Saracen pirates jumped from the cliff full of remorse and was turned into the vertical, isolated rock you can see in the sea. Milos is an volcanic island with natural geothermal heat. 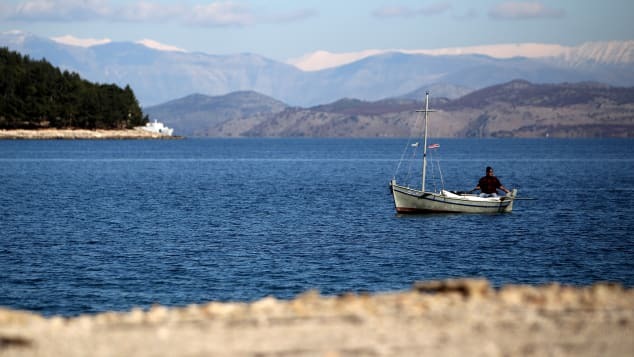 The local taverna on the beach of Paleochori is well-known for its stews that are buried in the sand just before midnight and are ready to eat in the morning after being slow-cooked at a constant heat for eight hours. The various eruptions have resulted into more than 70 multi-colored beaches although none is more spectacular than the all-white limestone coast of Sarakíniko as shown below. Santorini features in everyone’s bucket list: shaped like a crescent, on the west it faces a submerged crater while on the east side it sports boundless stretches of black sand seen nowhere else in the Aegean. Hiking on the otherworldly slopes of two still actively volcanic Kammeni (“Burnt”) islands inside the crater while facing the main island whose whitewashed houses cap the cliffs like icing sugar is a vacation highlight. “Mamma Mia” fans might recognize the island of Skopelos from the big screen. Greece has featured in Hollywood blockbusters ever since 1957’s “Boy On a Dolphin” was shot on the island of Hydra, starring Sophia Loren. 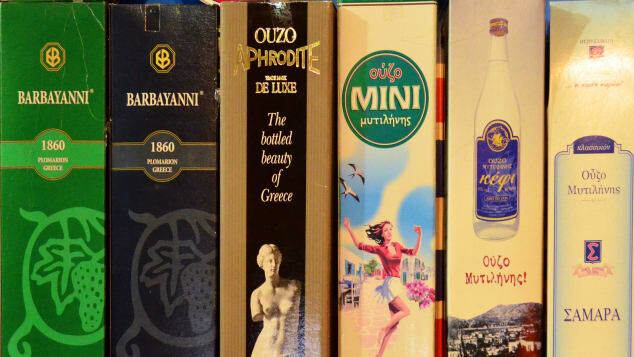 There have been many iconic films since — “Never on Sunday” introducing Melina Merkouri; “Zorba the Greek” whose syrtaki dance at the end has become a popular cliché; “For your Eyes Only” featuring Bond in the monasteries of Meteora; “Shirley Valentine” making a new life on Mykonos. The most successful has been “Mamma Mia” shot on Skopelos. 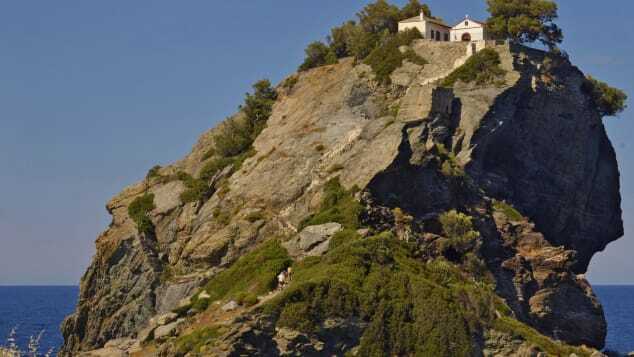 It draws fans of Swedish pop legengs ABBA fans from all over the world to recreate dance moves on its beaches and climb up the church of Agios Ioannis at Kastri shown here, where the final wedding takes place. Pyrgos, on the munciaplity of Tinos, is a haven for marble. Despite the onslaught of mass tourism, there are thankfully many Greek islands still overlooked by the big tour operators. Apart from the usual slew of beaches, Tinos sits on marble quarries since antiquity and its inland village of Pyrgos has no fewer than three museums devoted to marble. The location of a very demanding sculpture school, it sports a marble bus stop, several marble technicians’ ateliers and a cemetery that can double as an exhibition gallery of marble statuary. The palace of Knossos was the capital of the Minoan civilization, the first in Europe. 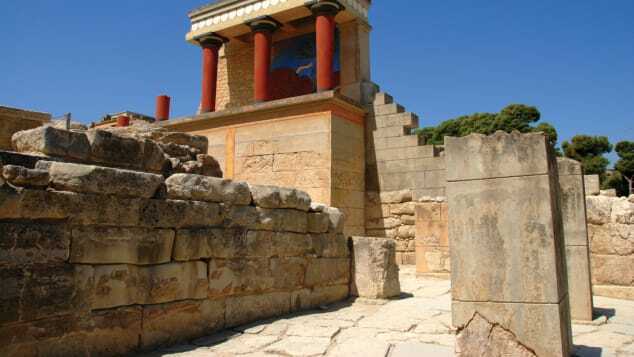 Knossos, according to tradition was the capital of the Minoan civilization, the first in Europe, and was inhabited from the Neolithic period (7000 BC) until Roman times. The palace depicted here has been associated with the legends of the Labyrinth and the Minotaur, and the flight of Daedalus and Icarus. One of the few archeological sites in Greece to be partially restored, its big draws are the Throne Room and the remarkable frescoes still adorning the walls. Ouzo is a traditional Greek alcoholic drink. Ouzo is a Greek aniseed-flavored alcoholic drink, traditionally drunk in narrow glasses, diluted with water that turns it a milky color. It’s accompanied by small mezedhes, a Greek version of the Spanish tapas. Although distilled all over Greece, the most famous names, as well as two museums, are situated on the island of Lesbos (Mytilini). On its “ouzo trail” you can visit no fewer than 16 different distilleries, each one with its own recipe and flavoring ingredients. Vergina is a UNESCO World Heritage Site, one of Greece’s best kept secrets. 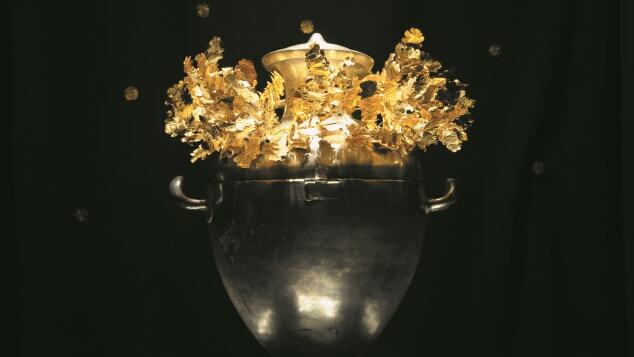 The Unesco Heritage site of Vergina is the best kept secret in Greece. Enter a mound near the town of Vérria and you can admire four unplundered royal Macedonian tombs, including one belonging to Alexander the Great’s father. The adjoining museum contains many artifacts from the tombs including this golden oak wreath. At 714 grams (1.5 pounds), it’s the heaviest — and with 313 leaves and 68 acorns the most intricate — yet found from Greek antiquity. Part of the fun when vacationing in Greece is renting a scooter or a quad bike and finding your own deserted beach to stretch out and relax. Although the island of Paros gets busy in the high season, the sheer number of nooks, coves and sandy strips that can’t be reached by car ensures that there is always some shoreline with your name on it. 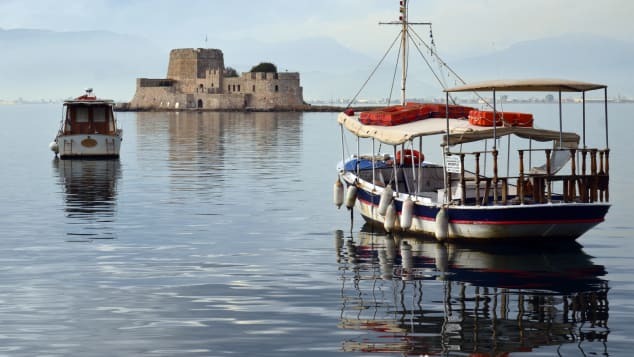 Nafplio was the first capital of modern Greece and home to several spectacular forts. Well defended by not just one but three separate forts — one of them in the middle of the bay — it’s no wonder that Nafplio became the first capital of modern Greece (1823-1834). 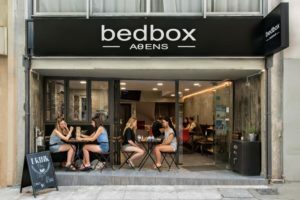 Displaying vestiges of its Greek, Ottoman and Venetian past and with elegant 19th century alleys overflowing with bougainvilleas, it’s the best base to explore the antiquities of Argolid (Mycenae, Tiryns, Epidaurus) as well as providing the best one-day excursion from Athens on its own accord. 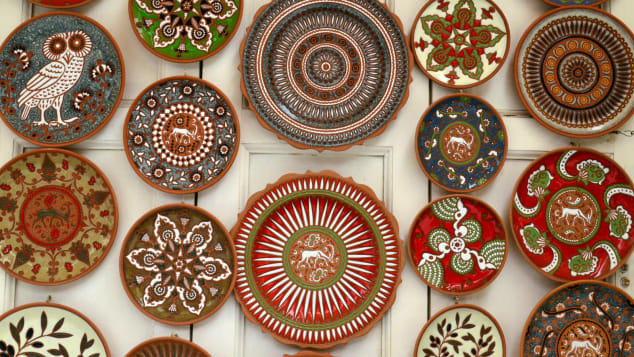 The town of Rhodes has been known for its ceramics since antiquity. Shopping in Greece is a delight with local craft traditions passed through families for generations in jewelry, silverware, textiles and pottery. Rhodes has been known for its ceramics since antiquity; indeed clay bricks from the island were used to build the dome of Hagia Sophia in Constantinople. Today the island of Rhodes is again on the forefront with its colorful decorative designs, some of them modern, others inspired from the exhibits in the Rhodes archeological museum. The Acropolis is Greece’s most famous monument, a symbol of Greek antiquity. Greece’s most iconic monument is a sacred rock devoted to the Goddess Athena, protector of Athens. 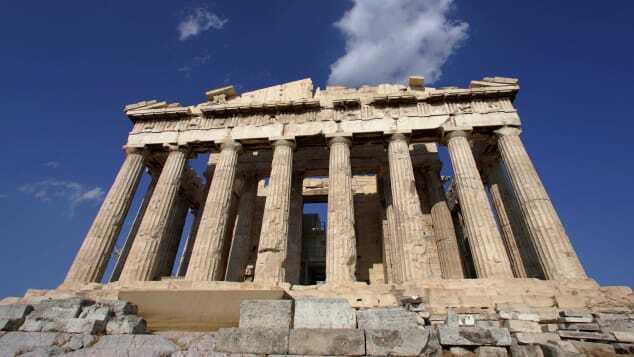 The current incarnation stems from the mid-5th century BC sporting several buildings including the Parthenon, the archetype of classical architecture, mimicked throughout the globe. Plundered over the centuries and partly destroyed in 1687 during a Venetian bombardment against what was then a Turkish fort, the Acropolis still maintains its charisma. The closed bay of Lindos, overlooked by an ancient Acropolis that you can still reach by riding a donkey, is one of the safest bathing beaches on the island of Rhodes, much preferred by families. If it’s full, then try the smaller, less crowded bay on the other side of the Acropolis, whose postcard-perfect monastery of St Paul is very popular with local and foreign weddings. 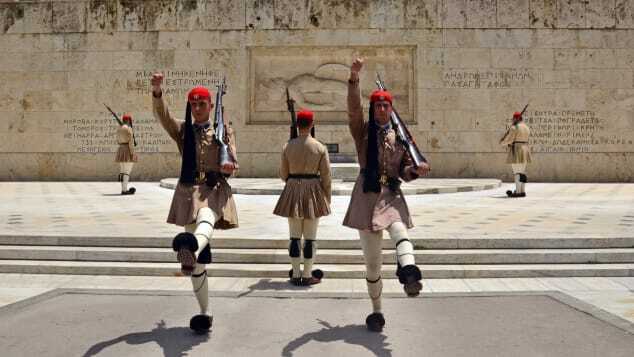 Athens’ “Changing of the Guard” is a big tourist attraction. Despite its glorious past, Athens is a modern megalopolis with a neoclassical 19th century center. No building from that era is more striking than the old Royal Palace, now the seat of parliament and site of the Tomb of the Unknown Soldier, It’s guarded by the Evzoni guards, highly Instagrammable, in their traditional red caps with long black tufts, pleated kilts and tsarouchi shoes (red moccasins with black pompoms). The Changing of the Guard is a big tourist attraction, with an impressive choreography. Mycenae, setting of the Homeric epics, became one of the first excavated sites in Greece when archeologist Heinrich Schliemann discovered several grave mounds in the 1870s. He called the most impressive, “The Tomb of Agamemnon,” because of the wealth of golden implements found inside. The monumental tomb, whose lintel stone above the doorway weighs no less than 120 tons, is the most awe-inspiring remnant of the Mycenaean civilization portrayed so meticulously in the Iliad. Delphi is a spectacular archaelogical site. 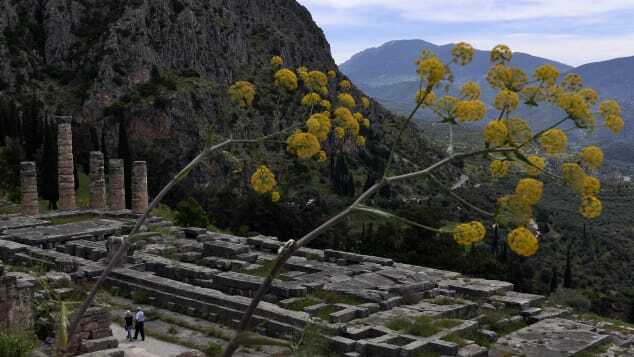 Of all Greece’s archeological sites none is situated more spectacularly than Delphi, the site of the famed oracle of antiquity and the Ancient Greek center of the world. It lies on the stony slopes of Mount Parnassus, in a ravine carved by the Phaedriades, two twin rock formations than envelop Apollo’s sanctuary, leading the eye towards the Corinthian gulf. Thanks to its waterfront views, Chania is often called Greece’s most beautiful town. 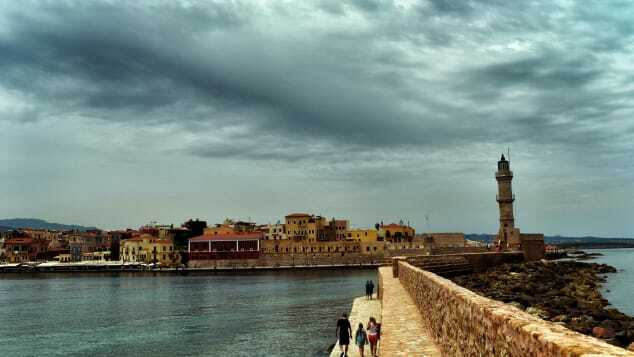 Many people call Chania The Most Beautiful Town in Greece and for good reason. The Ancient Greeks, Byzantines, Genoese, Venetians, Egyptians and Turks have all left their signatures in the town and its picturesque port. A quick stroll in its narrow lanes takes you past mansions with gates adorned with medieval coats of arms, attractive Jewish merchant houses, well-preserved Ottoman mosques with Egyptian minarets — in short the whole Mediterranean in miniature. 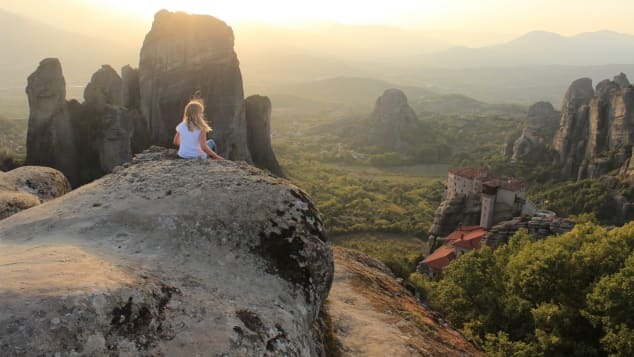 The spectacular rock towers of Meteora. The complex of six Eastern Orthodox monasteries built vertically on the rock towers of Meteora is one of the most awe-inspiring in Greece. Hermits and mystics have been staying in rock caves here since the ninth century AD, although the first monastery wasn’t established until around 1340. The steepest monastery (Roussanou) is inhabited by nuns who used to be winched up and down with ropes and nets as late as 1930. Corfu is an idyllic Greek island. There is Greece and there is Corfu. New visitors whose idea of a Greek island is a dry sundrenched rock in the Aegean are amazed at the amount of greenery that covers Corfu. The short English rule in the 19th century has also been influential. It may be the cricket ground in the center — the only one in Greece — but there’s a distinct feel of rural England in Corfu Town despite the usual Venetian touches you find all along the Ionian Sea. 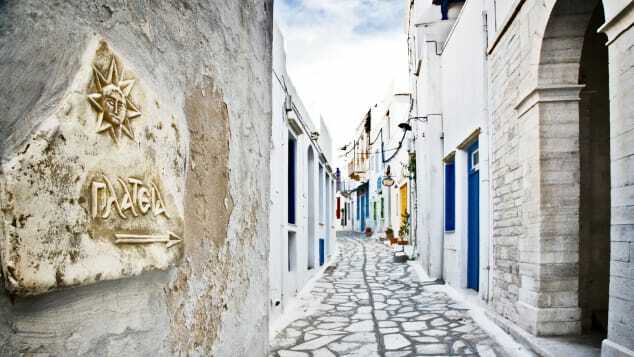 Losing yourself in the whitewashed maze of streets of Mykonos Town is part of the island experience that makes even the most cynical globetrotter coo with delight. Follow the sun west, though, and you’ll find yourself in “Little Venice” with houses built all the way to the wave line and balconies suspended over the sea. It’s here that sunset gazers congregate for a sundowner at tables that are booked days ahead. 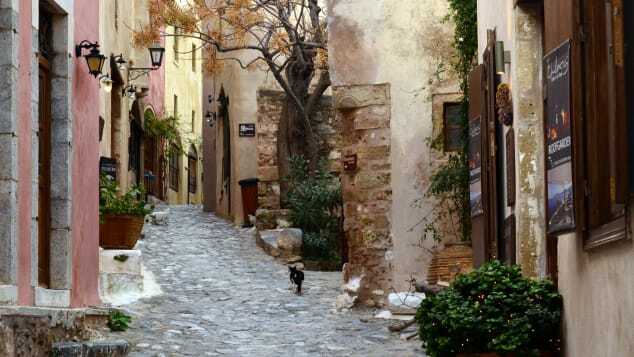 Monemvasia’s streets are unchanged since the Middle Ages. The granite rock of Monemvasia, called the Gibraltar of the East, harbors an impregnable fortified town of the same name with narrow, romantic streets that haven’t changed since the Middle Ages. The only concession to modern traffic is a small causeway that connects it to the mainland, but no cars are allowed beyond the gate. Its name, meaning “single entry” in Greek, was corrupted to “malmsey” in English, same as the famous wine that originated from the area. The stunning turquoise lake of Melissani has an unusual underground location. The turquoise lake of Melissani on the Ionian island of Kefallonia is situated 20 meters below ground in a cave whose roof has partly fallen in. The diffuse sunlight illuminates its deep waters and the surrounding rock formations in different hues depending on the time of day — the best views are around noon when the sun’s rays are vertical. 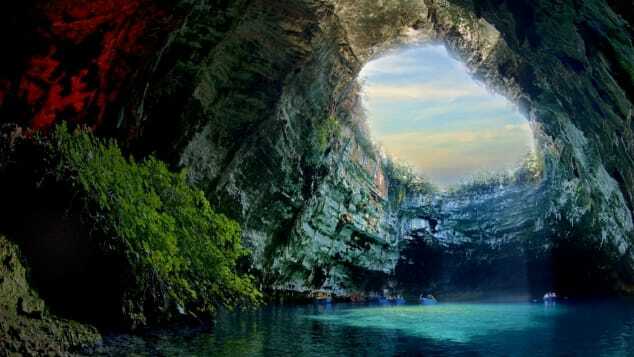 Although the cave was discovered only in 1951, the ancient Greeks knew about it: on a small island in the middle of the lake there is a shrine to Pan, the forest god. Thessalonki was named after Alexander the Great’s sister. 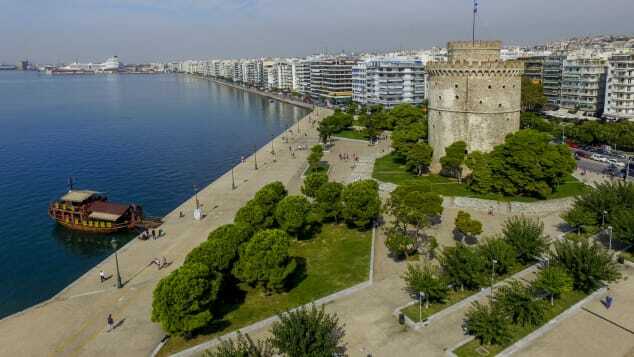 Unlike Athens whose significance diminishes after around the fifth century AD only to be resurrected as the capital of Modern Greece in 1832, Thessaloniki — the second city of Greece in terms of population — has had a long continuous history. Founded in 315 BC and named after Alexander the Great’s sister, it was the second most important city in the Byzantine and Ottoman Empires after Constantinople. The 112-foot iconic “White Tower” on the promenade, shown here, was built by Suleiman the Magnificent and served as a notorious jail well into the 19th century. On October 2, 1980, a ship, the MV Panayiotis, was washed up on the shores of Agios Georgios beach on the island of Kefallonia. Speculation as to the circumstances that led to the shipwreck have passed to the realm of legend with the vessel said to be carrying anything from contraband cigarettes to Italian Mafiosi. What is, however, irrefutable is the fact that it transformed a plain sandy cove to one of the most photographed and visited beaches in Greece. 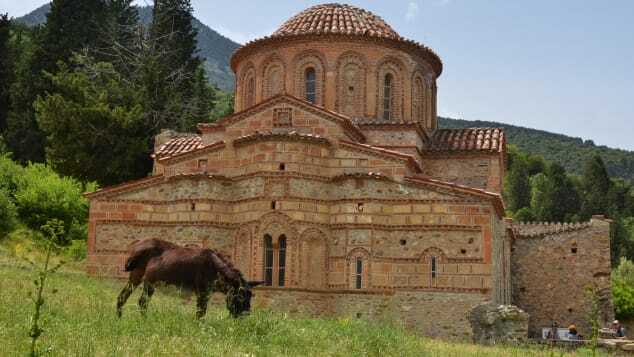 The medieval ghost town of Mystras. Mystras is unique: it’s a medieval ghost town on the eastern slopes of Mount Taygetus, just outside Sparta. It was built by French crusaders in the 13th century, but was soon captured by the Byzantines and became the seat of a medieval principality that extended over the whole of the Peloponnese. Abandoned in the 19th century, its frescoed churches, fortifications, mansions, as well as the grand palace, all add up to the most atmospheric site in Greece. One of Greece’s most scenic walks, the gorge of Samaria traverses Crete north to south for 10 miles. The cliffsides soar along the path up to 980ft, closing in at one celebrated stretch called “The gates” to a width of only 13 feet. The hike takes five to eight hours and can be taxing in the heat of the summer, so make sure you have enough water to get you through. Greece is a deeply religious country, the first in Europe to listen to St Paul’s preaching of Christianity. Every sizeable city venerates its own particular saint, but no cult is greater than that of St Dimitrios in Thessaloniki, a Roman commander said to be martyred around 305AD. As today’s modern church stands above an earlier one which was built almost immediately on the alleged spot of his martyrdom, the building is arguably the longest continuous Christian place of worship in the world. 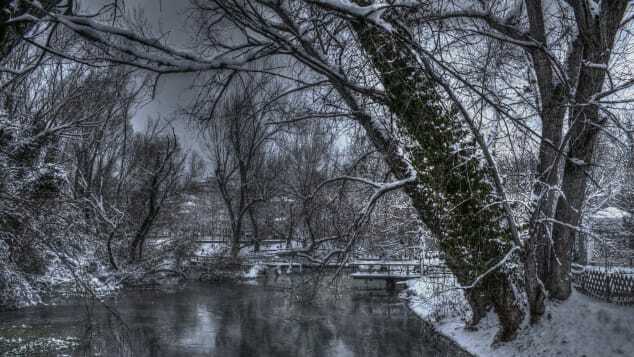 You can get snowy scenes in Greece too. Despite popular perceptions, it does snow in Greece, especially in the mountainous north where there are several ski resorts close to the city of Drama, Greece’s own Switzerland, pictured below. Falakron at an altitude of 2,232 meters (7,323 feet) is the most northern ski resort in Greece with the longest season and has 21 runs including five blacks and nine reds. The Androklis run that spans 2,200 meters with a drop of 617 meters is as good as any you can find in the Alps. The Pindus mountains on Epirus is one of Europe’s last remaining wildernesses and the Zagori villages near the border with Albania offer some thrilling experiences. Here you can go canyoning, rafting and kayaking on three pristine rivers or go hiking on the Vikos gorge, which, with drops up to 3,000 feet is the deepest gorge in the world according to the “Guinness Book of Records.” You can get a raft from SeaKayakExplorer.com. Greece has become a canvas for street artists. Graffiti artists have exploited the recent economic downturn in Greece to their advantage. 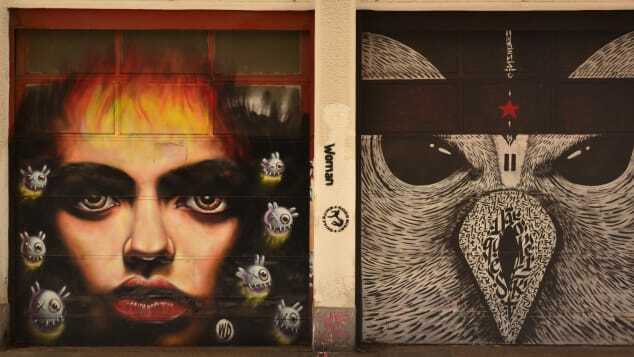 Shuttered houses, derelict walls and abandoned houses have provided the canvas for an explosion of street art. The booming Athens scene have drawn spray-can artists from all over the world, like the Balinese-born WD (Wild Drawing) who’s made Athens his home. This Greek snack is simple but delicious. Greek traditional sweets are very similar to those in the Middle East in that they’re based on honey rather than sugar. Many of them are prepared on specific holidays. 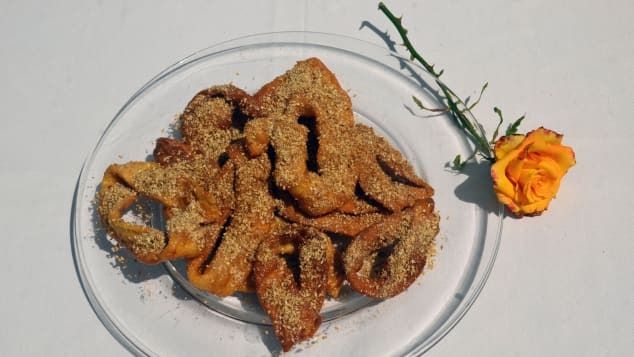 The diples pictured above originate from the town of Kalamata in the Peloponnese and are served traditionally at Christmas time. Their simplicity (fried dough turnovers laced with honey and topped with walnuts) belies their deliciousness. Apart from being the launch pad for all hiking expeditions to Mount Olympus, the small village of Litochoro has one of the most magnificent settings in Greece. To the west rises the 9,570 feet-high “abode of Greek gods” while to the east spreads out the tranquil, blue waters of the Gulf of Thermaïkos. The climb to Mytikas, the highest peak of Mount Olympus usually takes two days with an overnight in a refuge three hours’ walk below the summit.